There are a lot of variations, including potato versions and mixed-potato/carrot versions, but this time we went with 100% carrot. It may seem a bit odd, but these little guys are a nice snack to incorporate if you’re on a diet, since you get whole grains and vegetables plus a sweet dessert for about 150 calories or so per pastry. Boil carrots until tender. Drain well and pat dry. Puree in a food processor, food mill or ricer. 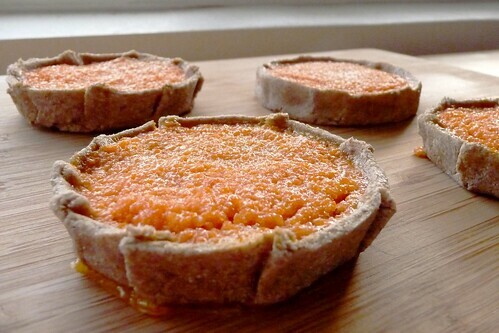 Combine sugar, salt, sour cream, eggs and flour with the carrot puree1 and set aside. By Hand: In a large bowl or on a clean worksurface, sift together flour, sugar and salt then add lard. Mix the lard into the flour with your fingers until it’s reasonably uniformly crumbly. Make a well and pour in the water, mixing it together until a dough begins to come together. Knead into a stiff, but rollable, dough. Using a Food Processor: Combine flour, sugar and salt in the bowl of a food processor fitted with the chopping blade. Pulse two or three times to sift ingredients together. Add lard in small chunks. Pulse 8 – 12 times, just until the mixture becomes crumbly. Pour in the water and pulse another 8 – 12 times until the dough forms. Remove and knead by hand for a couple of minutes until the dough is stiff and workable. Roll out the dough on a floured surface to about 1/8th inch thickness. 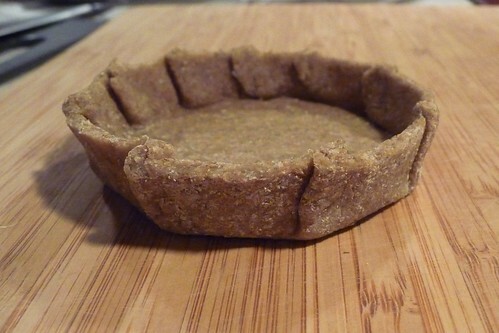 Cut out rounds with a large (4″ to 5″) biscuit cutter. Bring up about 1/2″ of the sides to form a 1/2″ rim, pleating as you go, to produce a small “dish.” Pleating will enable the border to stay up and contain the carrot mixture. Arrange on a parchment or silicone-lined half sheet pan. This is about what it should look like when you’re done. Spoon the carrot mixture into each little dough “dish” until it almost reaches the top. Brush each carefully with beaten egg. Bake for 25 – 30 minutes until the dough is crumbly and (hopefully2) the carrot filling is browned. 1. If your carrot puree comes out overly wet, you may need more flour or to drain off a bit of the carrot juice so that it is somewhat dry. 2. We didn’t get the carrot to brown before the dough had gone too far, so I still need to work out some bugs here. This entry was posted in dairy-free, gluten-free, latvian, pie, recipes, snack, untranslated, vegetarian. Bookmark the permalink.